What kind of craziness is this?! We have 5... count them, five wireless access points within the confines of these four walls. Wow! What's the 'moobugnet-garden' one? (Or is that a daft question?). I'd love to be able the net from our garden, so am hoping to pick up some advice. It's a wireless repeater to extend the reach of our network. 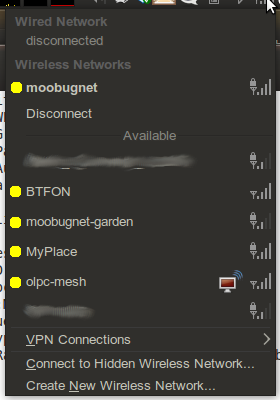 moobugnet is our primary wireless router, and is at the front left-hand corner of the house. moobugnet-garden (usually) lives at the back right-hand corner of the house, picking up the signal from moobugnet and sending it out again. Thanks for the info Dave! A 'wireless repeater' - I'll shop for one of those in the spring.